I can’t help but marvel at how interested my kids are in the previous life of their ‘green toys’ and these wooden shaped wonders made from recycled wood are sure to pique their interest. Imagination has no limits here – haven’t you ever wondered what would happen if you mix an elephant with a Stegosaurus? 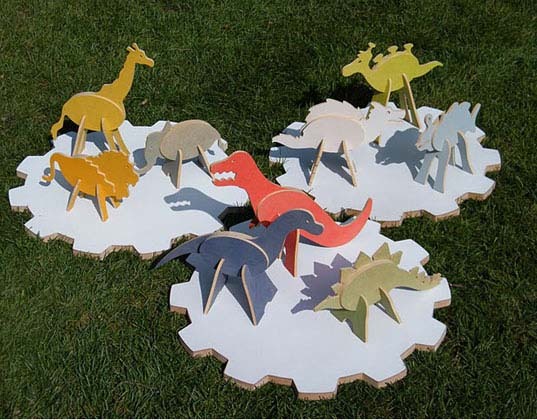 Topozoo is a new collection of toys using individual wooden shapes to create magnificent mini characters. Each set consists of fifteen pieces to form three creatures plus instructions on how to make them. Choose from three Topozoo sets – Safari will make an elephant, giraffe and lion; Dinosaurs will create a T-Rex, Stegosaurus and an Apatosaurus; a Monsters set has a Snow Beast, Space Alien and a Sea Monster. The best bit is that your child’s imagination is the limit. You can collect all three sets and combine pieces to make many, many different designs. Using recycled wood and child friendly colour stains, Topozoo characters have a fantastic earthy look to them and would look gorgeous lined up on a shelf between plays. Topozoo is not yet released but we’ll keep you updated on pricing and availability – I’ll be keeping my fingers crossed for a local stockist!